P1	P2	P3	P4	P6	P7	P8	P9	P10 What are Natural Resource Charter precepts? In recent years, deposits of natural gas—currently estimated at 57.27 trillion cubic feet—have been discovered in Tanzania’s territorial waters. If the investments necessary to exploit the largest deposits go ahead, the better part of a decade will pass before significant gas revenues begin flowing. Many challenges must be addressed in that time in order to maximize the opportunities that gas production will bring. These challenges can be very difficult to overcome, but the “resource curse” is not inevitable. If Tanzania’s natural gas is managed well, it has the potential to substantially contribute to the long-term sustainable growth of the economy and its diversification into higher value-adding activities, which will ultimately improve living standards in Tanzania. Good governance is a critical prerequisite for this outcome. The government of Tanzania has taken seriously the challenges posed by the extractive sector and has begun to develop its response. In July 2015, it passed three pieces of legislation which lay the foundations for strong governance of the sector: The Petroleum Act, the Oil and Gas Revenues Management Act and the Tanzania Extractive Industries (Transparency and Accountability) Act. The passing of these acts is a positive step, but there is still much to be done. 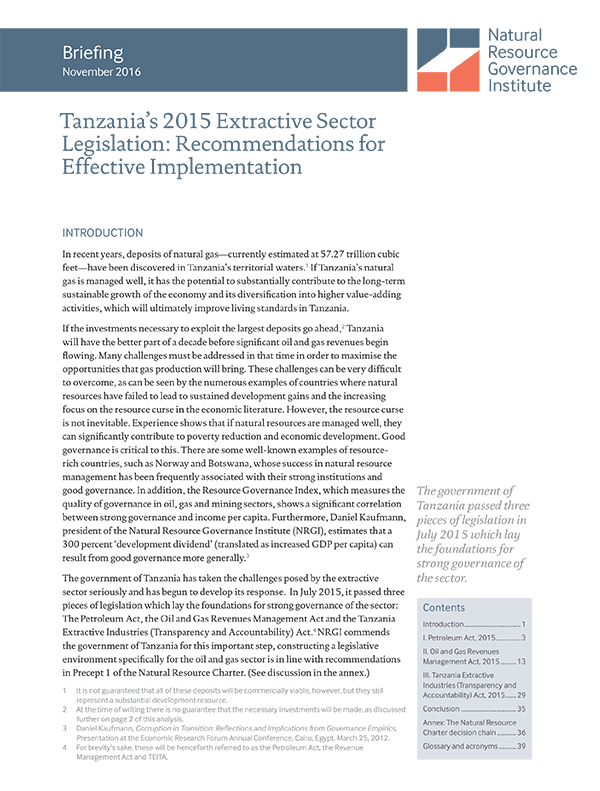 The analysis in this document is intended to identify potential challenges that the Tanzanian government ought to address in the process of developing regulations and implementation strategies. It also reveals that despite the solid principles established by the Revenue Management Act, some improvements are needed that go beyond what can be achieved through regulation. The gaps in the act are such that officials should consider a consultative review.